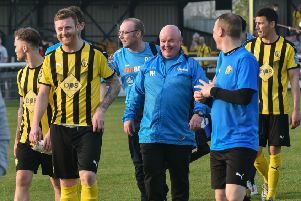 Brakes made it 13 points from 15 with a derby victory over Stratford on Tuesday night, writes Paul Okey. The home side deserved the win on the strength of chances created, especially in the first half, but their failure to kill off the game led to some anxious moments in the closing stages. Ben Mackey, into the starting line-up at the expense of the injured Rob Ogleby, had Leamington’s first chance in the ninth minute, but he failed to get decent purchase on his header after Richard Taundry had picked him out at the far post. Taundry sent an ambitious effort well over, while Sam Austin was also off target after the ball was returned to him following a corner. Austin was quickly on to a loose ball after Connor Gudger’s shot was blocked as Brakes ratcheted up the pressure, but despite the ball shaping well, it failed to test Andy Kemp in the Stratford goal. Courtney Baker-Richardson was then denied by Kemp in a one-on-one, with the keeper bravely getting down to get a hand to the ball and send the striker wide. Baker-Richardson retained possession but his subsequent cross was cleared. Taundry skidded a free-kick wide from a central position just outside the box and Baker-Richardson looked to be through again, only to fluff his shot. Stratford served notice of their threat when a mishit corner found its way through to the far post unimpeded, but Breeden comfortably pouched the resultant shot. Brakes got the breakthrough in the 32nd minute, Austin cutting inside and picking out Baker-Richardson who guided his header into the corner of the net. Despite the goal, the game continued in a low-key fashion until the break, with Stratford enjoying a spell of possession in the closing minutes without testing Breeden. The home side made a busy start to the second period with Mackey denied before a neat turn in the box by Baker-Richardson presented the former Kettering forward with a shooting chance. His sidefoot effort drew a strong hand from a diving Kemp, with Moore’s follow-up blocked by a defender before he scooped his second effort over the bar from close range. Brakes had a let-off in the 53rd minute when James Mace and Jamie Hood allowed Richard Gregory to get between them and on to Jamie Sheldon’s speculative ball forward. Gregory’s first touch took him around Breeden who had raced out of his area but his second touch saw him loft the ball wide of the empty goal. Jack Roberts flicked over a header for the visitors but it was still the home side who were carving out the better chances, Baker-Richardson again denied by a fine save from Kemp. An Austin shot was deflected safely into the arms of Kemp, while the lively Baker-Richardson curled an effort over the bar. Hearts were in mouths in the 74th minute when Mace played two Stratford forwards onside and Mark Magee looked to be upended by a lunge from Breeden. However, referee Robbie Dadley waved away Stratford penalty appeals. In the dying minutes, Anthony Charles whistled an effort over the Leamington bar, while Jack Roberts’ shot was comfortable for Breeden as Brakes hung on for a precious three points. Brakes: Tony Breeden, Richard Taundry, Connor Gudger, Joe Magunda, Jamie Hood, James Mace, Lee Moore (Ross Oulton, 90), Jack Edwards, Ben Mackey (James Fry, 78), Courtney Baker-Richardson, Sam Austin. Subs not used: Ben George, Jamie Tank, Eddie Caviezel-Cox. Stratford Town: Andy Kemp, Aaron Stringfellow (Liam Francis, 85), Kieron Westwood, Marcel Simpson, Jack Roberts, Anthony Charles, Aaron Moses-Garvey, Michael McGrath, Mark Magee, Richard Gregory (Simeon Tulloch, 74), Jamie Sheldon. Subs not used: Gary Moran, Emmit Delfenouso, James Cutts.